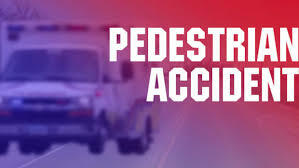 Paris Pedestrian Struck by Vehicle On Jefferson Rd. An accident was reported at 8:08 P.M. on September 19, 2018 where a 49 year old man was struck by a vehicle in the 3600 block of Jefferson Rd in Paris. The 46 year old driver of the vehicle advised that she did not see the person walking at the edge of the roadway. His condition is unknown at this time. No other information was released.